Luci Barker: Birchbox Unboxing | March 2019. So it's that time again,where I share all the Birchbox goodies that came in this months box. It doesn't feel like a whole month since I did the last one, but somehow it is! I really hope you're enjoying this series on my blog, as I'm really enjoying writing it. This months box had mainly mini samples in it, with a couple of full sized items and I think it's a good balance and I'm quite excited about all of them. The first Products I pulled out of the box this month was the Generation Clay Mask. which is a brightening purple clay face mask. I haven't heard of this brand or product before but I did a bit of research and I heard some read some good things about it. I love a good face mask, so I'm looking forward to seeing how this one works on my skin. Another skincare product that I got was the Glam Glow Tropical Cleanse. The way they describe it on the website sounds like an actual dream. It's said to 'deeply cleanse and buff away dull skin cells to reveal your best ever glow' ... ugh yes please, pass me 10! I've only tried one or two products from Glam Glow before and I really like how the products work, they're just a little pricey. It's such a hyped about brand in the beauty world and no surprise there because they're products really high quality and work wonders for my skin. Next up is the Daisy Love Perfume from Marc Jacobs. This is such a popular perfume and I have been wanting to try it out for such a long time but, when it comes to perfumes I always seem to stick to my faves. It has a very refreshing, floral scent, with woody notes and cashmere musk. Although I don't usually go for floral scents, I surprisingly like the scent and it seems like one this will be one I reach for in the coming months. I may have to treat myself to a full size bottle. Going back to skincare now, I then pulled out the Daily Concepts Charcoal Soap Sponge and I'm pretty sure that I got this in a Birchbox before, but it may have been from somewhere else. I love using charcoal products on my skin because they're said to be really good for your skin, as it draws all the crap out of it basically ... I'm not sure the exact properties of it but it always gives my skin some much needed TLC. I then picked out the Chella Brow Cream in Taupe. Although I'm into proper bold brows, I think that this will give me a good old natural look to my brows, so I am looking forward to trying it out. I do think it'll be a little light for me though, as my brows are usually browny/black, so we will see. Last but not least, I received The Beauty Crop x Birchbox 'You Go Girl' Bronzer. I always seem to be switching up my bronzers and using all the different ones in my collection, so I decided to try this out once I had opened the box and started doing my makeup. I think this bronzer is the perfect shade for my skin tone as it's not to light or dark, but it has a slight bronzey/ almost orangey sun kissed glow to it, and it works perfectly for a quick bronze up, or even a more defined contoured look. As you can see from my comments on this, I am very happy with this months box and am excited to try each product out. 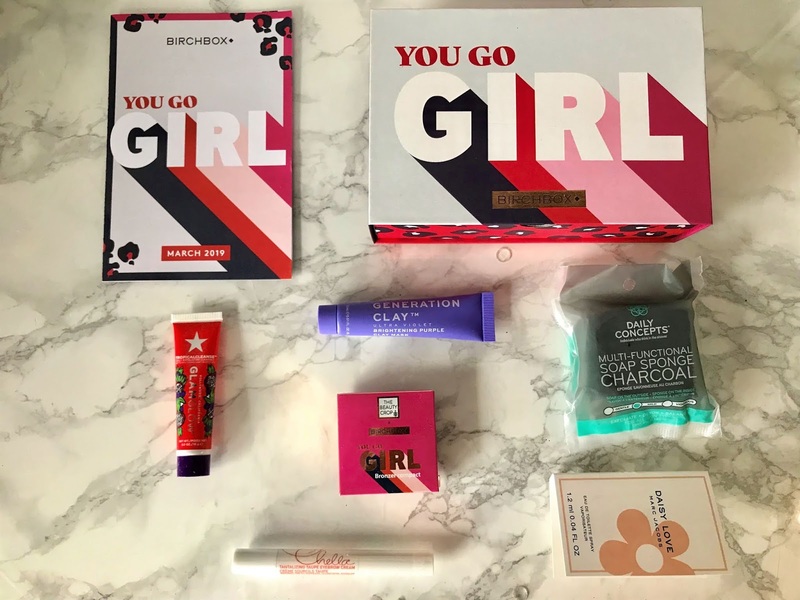 Thankyou so much for taking the time to read this post, I hope you enjoyed taking a peak into this months 'You Go Girl' Birchbox and I will see you soon!